Playing with Electrons to Make Stories: What I wear is an expression of who I am. Author's Note: Here is more information about the Manukari, a group I have based upon: the Romani, Indian Culture, and Noh & Kabuki theater. I have also included 4 magic pieces of head-wear that are commonly used by the Manukari. The first post about the Manukari can be found at this LINK. The Manukari are part of the Dreamland setting I am slowly working on, which can be found at this LINK. The systems I used to make the magic items are: OSR / LotFP / AD&D, Into the Odd, and Pits & Perils. I am willing to convert these things to over systems by request. As always, I look forward to any comments, suggestions, or questions you may have. They are like any other group of people, filled with saints and monsters while the majority live between. There are those who revel in the richness of their own culture, while others forsake it for another. In the end, they are human, and in being so have no single story, but rather a multitude from every individual. A common factor, as common as individuality would allow, is a love for dance and music. 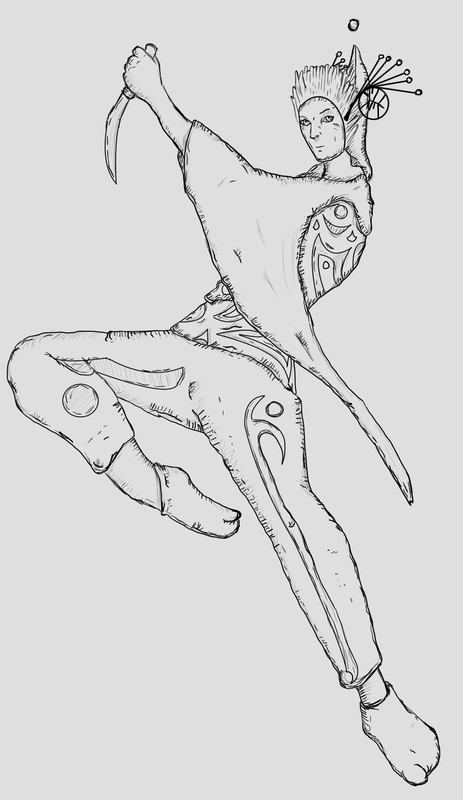 One might blame the blood and its influence of genes, while others might point to culture, however, the Manukari hold that it is their souls that call them to love the rhythm of step and strum. Their magic is based in song and dance, and from it they are capable of wonders both terrible and great. Accordingly, their arcane crafts are focused upon song, dance, and pageantry. One might find these creations in bazaars in far lands, or pawned in dingy shops nearby. While at one time they held their creations dear, their fall from grace has lead to times that become leaner by the day. With the youth abandoning their caravan homes for sessile life in cities, the nomadic families have become thinner with years. In the hopes that new blood might reinvigorate the Manukari culture, the elders have been allowing those who prove to possess an Atmamanu (a Manukari wise soul) to join their families. Others who assist the families, and show honor, are allowed to journey through the lands with them, or are given rare gifts as a sign of the Manukari's favor. Perhaps you might hear more of these vibrant, but enigmatic people, perhaps not. A storyteller tells stories as their mood strikes them, and this one may wish to remain silent on the tales of the Manukari. What is less perplexing is their arcane crafts, which I lay before you, an offering for you to take or leave as you please. Part of the Manukari culture when concerning dance and song is pageantry. It is not merely enough to dance and make music, one must show outward signs of the message being communicated. Each headdress or mask is linked to a set of dances, each set having its own theme. To gain the benefits of these magical crafts one must dance or make music for a short time before the piece awakens to bestow its blessing. The amount of time needed in order to awake the headdress or mask differs from piece to piece. It is up to the GM/System as to what constitutes a successful roll to dance/make music. This headdress is used during funeral rites, at the bedsides of the dying, and places where the dead have become restless. Those in a 10 foot radius of the wearer are immune to the pains caused by death, though not the effects themselves. Those in a 10 foot radius of the wearer (including the wearer) are receive a bonus to their saves versus necromantic or death effects. +1 at 1st level of the wearer, and another +1 for every 4 levels after the 1st. The wearer gains a bonus to their AC against undead creatures. +1 at 1st level of the wearer, and another +1 for every 3 levels after the 1st. The wearer is capable of striking incorporeal undead with any weapon they are wielding as if the undead was corporeal. 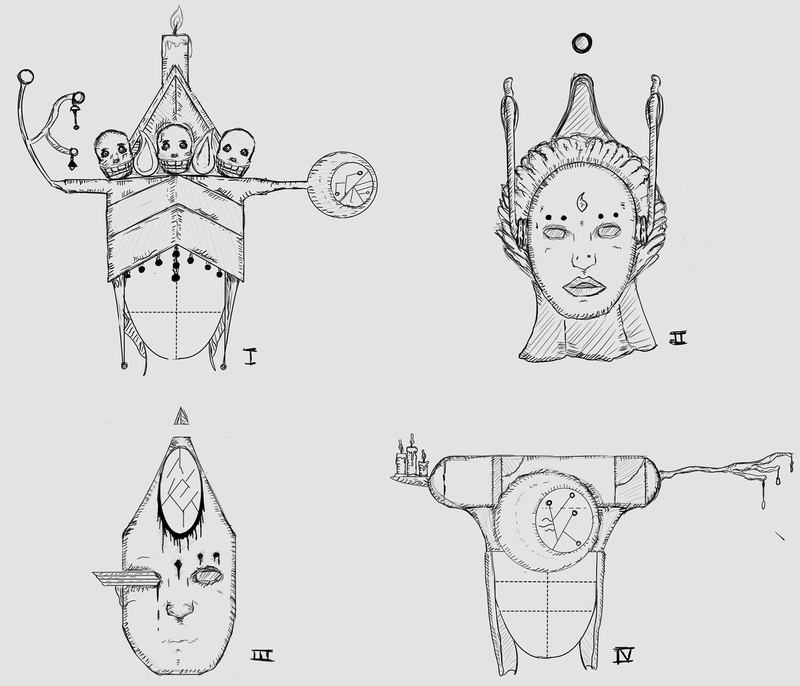 Those in a 10 foot radius of the wearer (including the wearer) are receive a bonus to their saves versus Arcana and other supernatural effects that drain Strength or effect the soul of the individual. At Novice the bonus is +1, the bonus increases to +2 at Expert, and +3 at Master. The wearer gains a bonus to their armor against undead creatures. At Novice the bonus is +1, the bonus increases to +2 at Expert, and +3 at Master. The wearer is capable of striking incorporeal beings with any weapon they are wielding as if the being was corporeal. The wearer gains a bonus to their Hits when attacked by undead creatures. +1 at 1st level of the wearer, and another +1 for every 2 levels after the 1st. (Hits lost only refresh if the the headdress is reactivated). 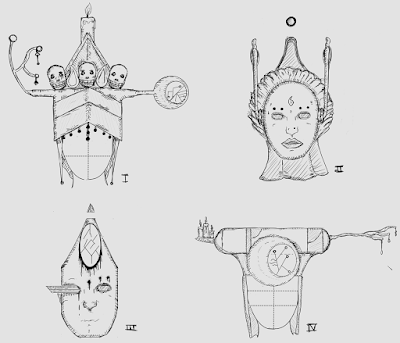 The mask is warn by those who guard the Manukari caravans, or during the rare instances a family caravan goes to war. Those who wear these masks tend to wield long-knives and shorts-words. The wearer gains a bonus to AC in combat. At 1st level the bonus is +1, this bonus increases by +1 for every 4 levels after the 1st. The wearer gains a bonus to-hit with Slashing weapons. At 1st level the bonus is +1, this bonus increases by +1 for every 3 levels after the 1st. The wearer gains a +50% bonus to their movement rate. The wearer gains a bonus to their Armor in combat. At Novice the bonus is +1, the bonus increases to +2 at Expert, and +3 at Master. The damage die of Slashing weapons wielded by the wearer increases by 1 step, even when impaired the lowest damage a Slashing weapon may do is 1D6. The wearer gains a bonus to their Hits in combat. At 1st level the bonus is +1, this bonus increases by +1 for every 3 levels after the 1st. (Hits lost only refresh if the the headdress is reactivated). The wearer gains a bonus to-hit with Slashing weapons. At 1st level the bonus is +1, this bonus increases by +1 at level 8. This mask is worn by healers and doctors, granting them the ability to heal fresh wounds, aide the poisoned and sick, as well as regenerate lost limbs (though at a cost to themselves). 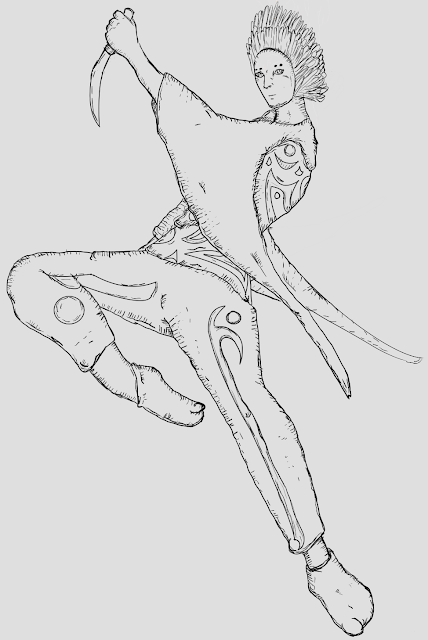 Benefit Duration: The benefits of the mask only function while the wearer is dancing, plus for 1 round afterward. Those in a 10 foot radius of the wearer (including the wearer) heal 1 point of damage per round. Those in a 10 foot radius of the wearer (including the wearer) are receive a bonus to their saves versus poison and disease. +1 at 1st level of the wearer, and another +1 for every 3 levels after the 1st. 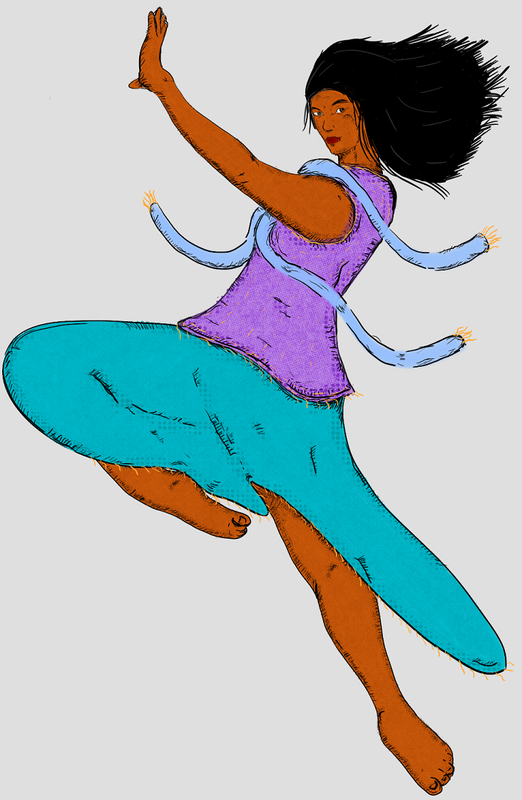 The wearer gains a bonus to their AC while dancing. +1 at 1st level of the wearer, and another +1 for every 3 levels after the 1st. The wearer is capable of regenerating the lost limbs of others, however each time this is done the wearer loses a digit off their hands or feet. While this may be done a few number of times without ill effects, too many fingers lost will mean an individual is unable to hold items, while the loss of a big toe will severely effect someone's balance. When the digits are lost, the individual feels no pain, and a smooth patch of skin is left where the digit once was. Those in a 10 foot radius of the wearer (including the wearer) heal 1 point of damage per round. This healing does not effect points lost from stats. Those in a 10 foot radius of the wearer (including the wearer) are receive a bonus to their saves versus poison and disease. At Novice the bonus is +1, the bonus increases to +2 at Expert, and +3 at Master. 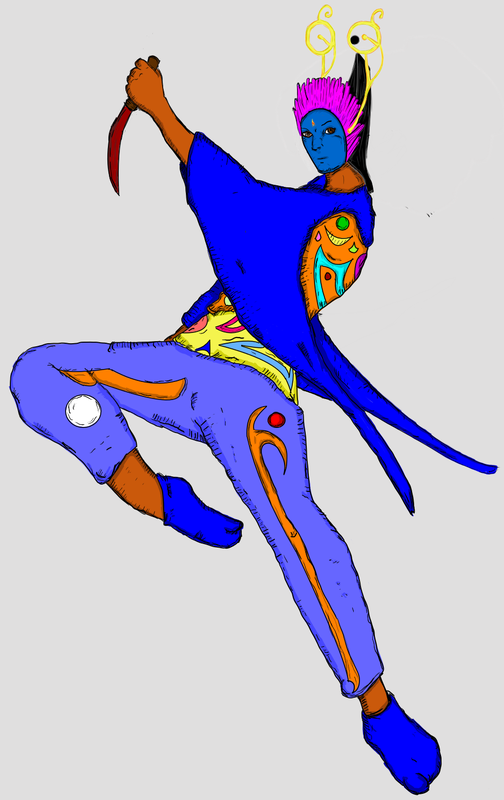 The wearer gains a bonus to their armor while dancing. At Novice the bonus is +1, the bonus increases to +2 at Expert, and +3 at Master. Those in a 10 foot radius of the wearer (including the wearer) 1 Hit of damage per round. Those in a 10 foot radius of the wearer (including the wearer) are receive a bonus to their saves versus poison and disease. +1 at 1st level of the wearer, and another +1 for every 4 levels after the 1st. The number required to hit the character while they are dancing increases by 1. 10 to 12 for 1 Hit and 13 for 2 Hits. This increase means that only individuals and monsters with bonuses to-hit are capable of scoring 2 Hits on the dancer. These headdresses are worn by caravan masters/mistresses, as well as those assigned to guide members of the Manukari. Anyone within 10 feet of the wearer is able to see perfectly in any natural lighting condition, be it low-light or complete darkness. The wearer is able to see perfectly through any type of darkness, even magical darkness. Furthermore, the wearer may see through fog and smoke without hindered. The wearer is enabled to find the shortest, most direct route that he or she is seeking, be it the way to or from or out of a locale. The locale can be outdoors or underground, a trap but not from spells like the maze spell. The ability will enable the wearer to select the correct direction which will eventually lead him or her to egress, the exact path to follow (or actions to take). The wearer is enabled to find the shortest, most direct route that he or she is seeking, be it the way to or from or out of a locale. The locale can be outdoors or underground, a trap but not from confinement created through supernatural means. The ability will enable the wearer to select the correct direction which will eventually lead him or her to egress, the exact path to follow (or actions to take).